Advertisement Announcer: Too much garbage in your face? There’s plenty of space out in space. To be animated can mean a number of things. While it obviously refers to the artistic process in which still images are strewn together in sequences to appear as though they are moving, it can also mean to bring someone or something to life. Pixar Animation Studios are masters of both of these animated meanings and their genius lies in their seemingly effortless ability to accomplish both of these feats simultaneously. In the studio’s history, they have managed to make toys playful when no one else was looking, the plight of a bunch of ants seem monumental and rats in the kitchen somehow not only normal but entirely justifiable. Despite all of these milestones, Pixar has outdone themselves with their ninth feature, WALL•E. It might be unfair to suggest that no other company could accomplish this but there is certainly no other company that could have done as good a job. WALL•E is short for Waste Allocation Load Lifter Earth-Class and the character himself is a collapsible box with curiously wide eyes that gets around on tank treads and solar power. He may be made up of nothing but rusting metal and parts that need frequent replacing but he is also the most endearing, romantic dreamer that Pixar has ever crafted. You just want to squeeze the little guy. Trust me; the tetanus shot you’d need after that would be totally worth it. WALL•E takes place about 700 or so years from now. Taking an abnormally critical stance on humanity’s penchant to waste without fear of consequence, three-time Pixar director, Andrew Stanton (A BUG’S LIFE, FINDING NEMO), paints the future earth as being uninhabitable. It seems that somewhere around the year 2100, there will be so much garbage on the planet that not only will we need to stack it as high as the highest skyscrapers but we will also need to vacate the planet until the mess is brought under control. Enter WALL•E. Hundreds of similar units will work over the next six or seven centuries on a job that was only meant to last five years. The humans who once fled have inevitably all passed on but their future generations continue to float through space on giant cruise ships, oblivious to their history and unaware of their present selves. After so much time has passed, humanity has succumbed to its laziest impulses. We no longer require the need to think for ourselves when we have a multi-conglomerate doing it for us or the need to walk from here to there when we have a “hoverchair” to bypass this menial task. Earth is practically a forgotten memory for all but it is still there. Despite being covered in smog and dust and despite also a failed mission to clean up the mess, one WALL•E unit remains to keep the pursuit of love, happiness and hope alive. WALL•E is an unfortunate loner and even though his closest companion is a loyal cockroach, he never loses faith. He presses on every day in his near impossible mission to make earth inhabitable again without discouragement and with a nagging sensation that there is more to life than this. Considering he isn’t actually alive, that’s pretty impressive. When another robot, EVE, arrives on earth to search for signs of sustainable life, WALL•E finally gets the chance to see and understand what that greater meaning might be. Aside from being an eco-friendly science fiction piece, WALL•E is also a moving romance that is unexpected and unmatched by most recent films featuring actual human beings. When WALL•E first sees EVE, he knows it is love at first sight. He proceeds to follow her around everywhere she goes, shyly inching closer towards her whenever he feels the moment might be right. He is like a teenager in love for the first time. He doesn’t know how to make his move, just that he always wants to be around her. There is no desperation born out of ages of loneliness, just a certainty in what is in the air. The courtship of WALL•E and EVE is so innocent and simple that it seems almost silly that we as humans should have such trouble getting it right. 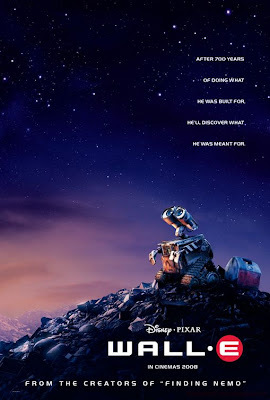 WALL•E’s ride is pretty smooth, full of laughs, touching moments and inspired cinematography (under the meticulous guidance of contemporary visionary, Roger Deakins) but all of this is expected from the Pixar peeps. There is a misguided attempt to incorporate live-action into the mix that adds a slight level of confusion but can do nothing to take away from the deeply satisfying whole. It is quite an extensive journey and it rests on the shoulders of one little waste management robot. WALL•E is unforgettable. His curiosity is matched only by his appreciation for everything in life that humanity has left behind. He may be goofy and clumsy but he is always open to possibility and hope. He is more alive than I am most of the time and the bewilderment and awe that fill his optical devices opened my eyes to things I had stopped seeing altogether. How can so much yearning and wonder come from one little robot, let alone one that is not actually made of real metal but rather drawn that way? WALL•E is simply a marvel to behold and the pinnacle of Pixar’s progressive mission to redefine what it means to animate. How many sheep would you give WALL•E ? Wall-E is the love child of Johnny5 and ET. He even looks a little like Johnny5, but he acts more like ET. I loved that little robot. But I wonder what happened to the other Wall-Es. They don’t explain that. You just see him looting the motionless corpses. All the family like the movie, it is humoristic, we all have fun. I agree with Matt concerning the other Wall-eS : What happened to them? It is a big question ! !